The future is upon us—but if you asked Marty McFly, he’d tell you we’re already behind schedule. When Back to the Future II’s time-traveling DeLorean blasted Marty McFly and Doc Brown to the future, they arrived on October 21, 2015. 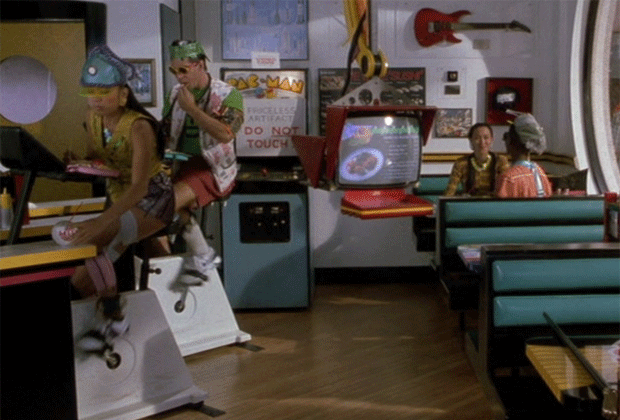 While the sci-fi comedy has already predicted some things about the future correctly (playing video games without hands, for example), other elements were rather off-track (phone booths and newspapers aren’t quite as prominent today as they were in the 1989 movie). Director-producer Robert Zemeckis and writer-producer Bob Gale knew that much of their vision of the future would not become reality by 2015—they did not believe mass-produced flying cars were just around the corner, nor did they think Jaws would get its 18th sequel. 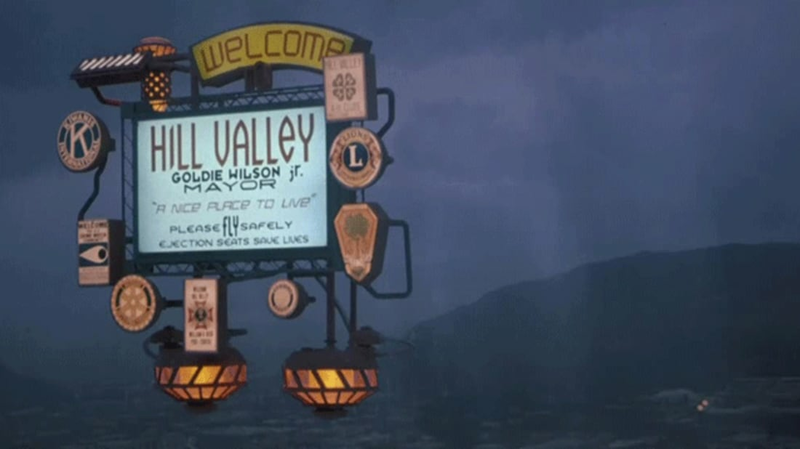 Even though comedic tone was often prioritized over plausibility, Back to the Future II’s creative team did extensive research about developing technologies for the film. Gale tells us he wanted to avoid the dark, dystopian world depicted in films like Blade Runner and make the future look like a nice place to live. “We wanted people to look forward to the future because, when we were kids," he says, "we always looked forward to the future." 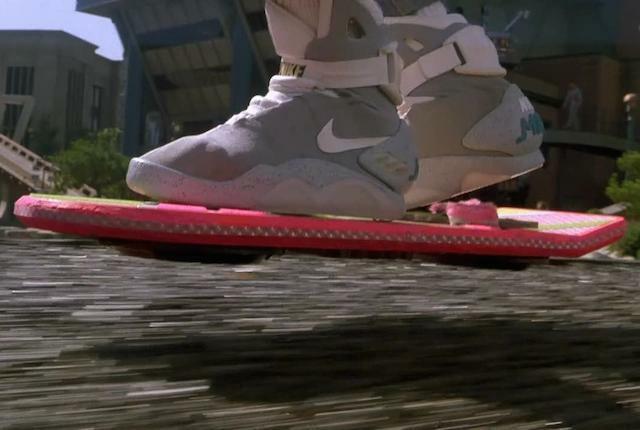 Consider Zemeckis and Gale successful on that account: Hoverboards captured the imaginations of movie-goers in 1989, and they still do today. So, should we put the soaring skateboard on our Christmas list for 2015? 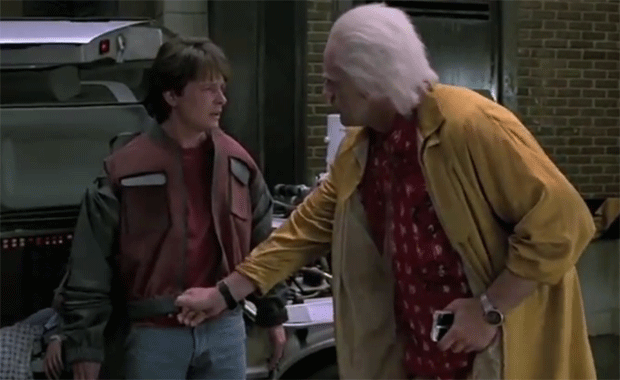 Let's investigate the likelihood of some of Back to the Future Part II's technologies making an appearance in the near future. 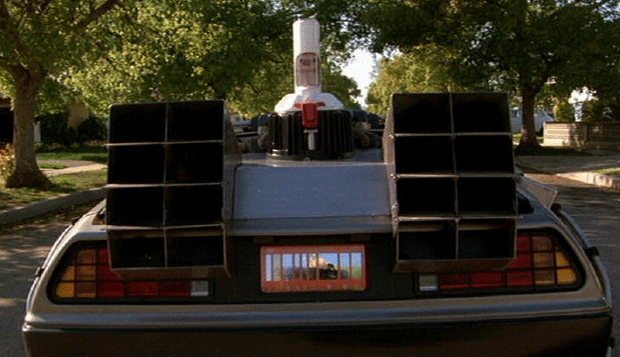 This could be the most on-schedule of Back to the Future's predictions. A year from now, you’ll be able to pay an inflated cab fee with the touch of a finger or unlock your front door without digging through a mess of keys. Important to the progress of this technology is the iPhone, no matter how glitchy the first rollout of Touch ID was. Today, just a handful of airports have biometric scanners to speed up your trip through security, but there’s a good chance this tech will be near-ubiquitous by October 2015, “especially with an organization like Apple getting momentum behind it,” says Jim Carroll, an Ontario-based futurist. Even if the developers at Mattel had a breakthrough and got the hoverboard ready for stores, there would be another force to overcome: lawmakers who choose what’s street-legal. Remember the Segway and how revolutionary it was supposed to be? New York-based futurist Michael Rogers says the hoverboard would probably be in for the same fate as the failed personal transporter. 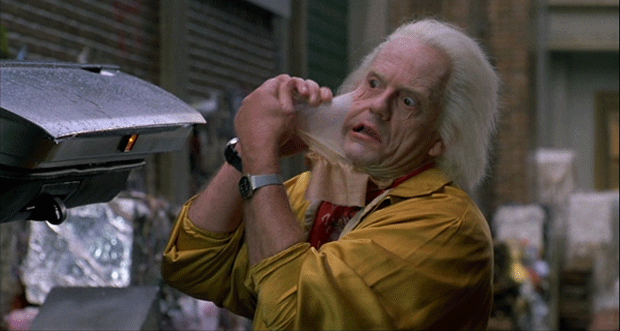 Doc Brown's visit to a rejuvenation clinic saved the film's makeup department from doing old-age makeup on actor Christopher Lloyd throughout the production, but modern viewers can also see Doc's de-wrinkling as a reality-based nod to the growing popularity of plastic surgery—and Doc’s replacement spleen and colon could be a near-future trend, too. Rogers says that in 2015 there will be some synthetic organ replacement, but it will still be in the experimental stage. According to Seattle-based futurist Glen Hiemstra, by 2030 or 2040 we will be able to clone our own organs and grow ourselves a new spleen or liver. Marty’s power-lacing Nike shoes and automatically adjusting jacket seemed like too good an idea not to exist. Nike has hinted at upcoming power-lacing shoes, but don’t expect electronically size-altering clothing to be all the rage a year or two from now. Futurists predict it's more likely that we see infrared body scanners that take precise measurements for clothes and Internet-connected intelligent textiles that respond to heart rate and blood pressure. Parents are already discovering the benefits of that kind of technology with the Exmobaby System: pajamas that measure an infant’s body temperature and other vital signs. Forget 3-D movies—in Back to the Future's 2015, holograms are the newest trend at the multiplex. 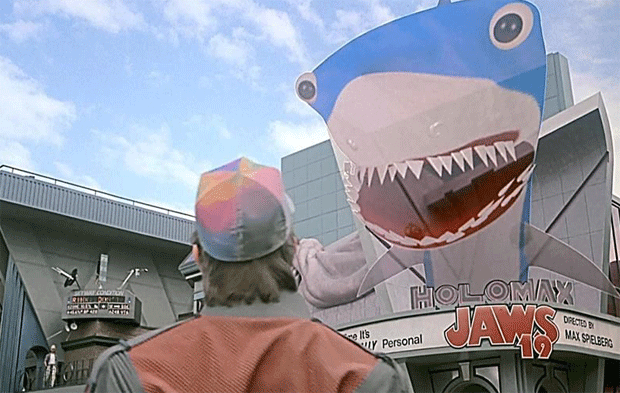 When Marty steps into Hill Valley’s Clock Tower Square, he sees a Holomax Theater marquee advertising Jaws 19, directed by Max Spielberg (oldest son of Back to the Future producer Steven). Even Hollywood's rapid sequel machine wouldn't have been fast enough to get a 19th Jaws installment in theaters by October 2015. Advances in technology would have to be just as fast, if not faster, to make holographic movies a reality within the next year. Hiemstra explains that holographic projections are still “fairly crude,” but the giant holographic shark that appears to eat Marty outside of the theater is not too far off from reality: As Rogers notes, interactive digital ads already interact with pedestrians in the real world. A long line of sci-fi movies would have you believe flying cars are just on the horizon. After watching a TV special in 1960 about what the world would look like in 1985, an 8-year-old Gale “was sure looking forward to flying cars,” he says. 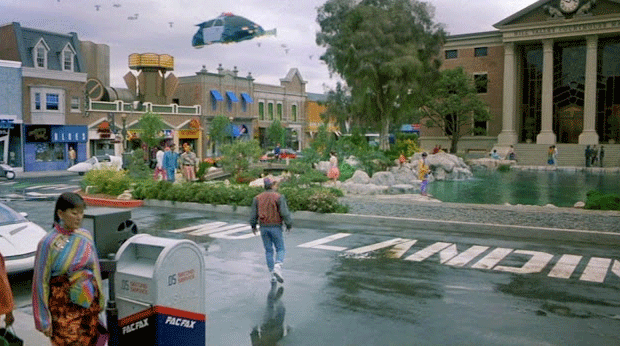 “I didn't think I'd ever have to get a driver’s license—I'd only have to get a pilot's license.” Alas, the real-world 2015 won’t have the prevalence of flying cars that future Hill Valley did. But futurists do have their eye on promising prototypes from companies like Moller International and Terrafugia. The biggest roadblocks now are the noise level of these prototypes and the Federal Aviation Administration. “There’s going to be a lot of lawyers between here and flying cars,” Rogers says. Hiemstra, however, is hopeful that affluent buyers will be able to purchase a self-navigating, personal flying vehicle by 2030. So where we’re going, we will need roads ... but not for long.